Step 2: Select the contact(s) you would like to add to a campaign by clicking the check-mark(s) next to the contact(s) on the left side of the page. Step 3: Click on the add to a campaign (envelope) button by Mass Actions to assign the selected contact(s) to a campaign. Step 4: Select the Campaign to which you would like to add your contacts from the dropdown box. Step 5: Be sure to click the Save button for your contacts to be added to the campaign. To put a group of contacts to a campaign, it is good to first filter to find this group. For example, you may first filter your list by a tag to assign all of those contacts to an email campaign. 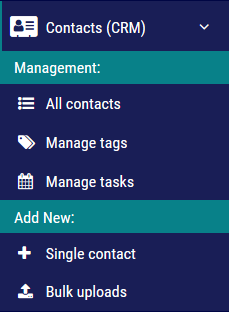 Step 2: After you have filtered your contacts (for example: if you desire to mass assign all contacts with a certain tag), click “All Contacts” (to export all contacts) or “All on Page” (to add all contacts you see on the page) in the SELECT drop-down menu on the bottom of the page.